The Great American Homestore (GAHS) is a locally owned and operated full line home furnishings company providing the Mid-South’s largest selection of quality furniture, bedding and accessories at simply unbeatable prices. The Great American Homestore (GAHS) was founded in 2004 in order to provide the consumers of the Mid-South with the greatly needed convenience of a truly exquisite One-Stop Home Furnishings Superstore. Since our establishment, GAHS has had one main concern: You, the every-day American consumer. We realize that your time is precious, and the more you drive across town looking for that perfect piece of furniture, the more expensive that furniture becomes. That’s why we at GAHS offer a giant selection of quality home fashion products, fitting the personal sense of style for every individual, ranging from traditional to contemporary, outfitting any room in your home, and all displayed under one roof! Our two lovely showrooms feature 128,000 square feet of infinite home fashion possibilities for you to browse and enjoy. 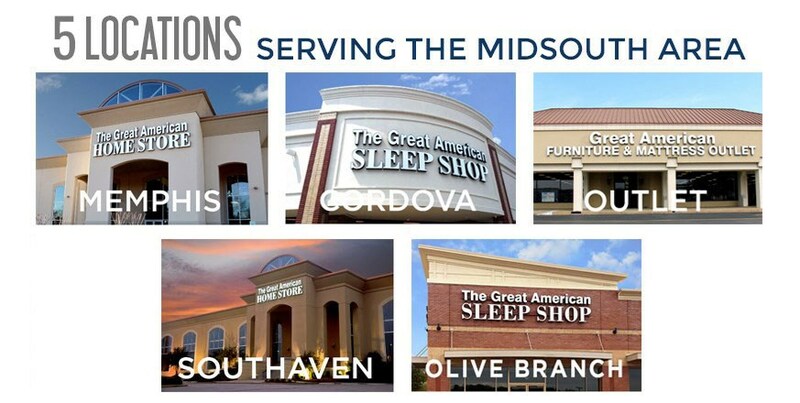 Whether you need to completely furnish your home, your business office, or if you just need to upgrade a single piece of furniture, our spacious showrooms are full of ideas and with the largest in-stock selection of furniture, bedding and accessories in the Mid-South. We are sure you’ll be able to find exactly what you are looking for at The Great American Homestore. Since we are locally owned and operated with pick-up and express delivery options, and most items in-stock in our 155,000 square feet warehouse, the furniture you want can be in your home today. The GAHS buying team is constantly searching the world over for the next hot style in home fashion products. We go to several markets a year and are continuously comparison-shopping to ensure you’ll be able to find everything from formal living to casual comfort when you visit our showrooms, at the lowest prices in the Mid-South. Also, since The Great American Homestore is backed by the manufacturer, we can promise that we bring you all of your furniture needs at prices that are far below our competitors’. At the Great American Homestore, we also understand the importance of offering a vast array of options for any budget. We offer many flexible financing options with approved credit so that each and every member of our community, from the budget-conscious to those with discriminating tastes, can find the perfect furnishings to reflect their unique style.